SG Private Wealth Advisors has announced plans to build a 65m motor yacht called Arianna II. A year after the 50m Arianna was delivered to its owner by Delta Marine, SG Private Wealth Advisors announces on behalf of their client plans to build Arianna II, a 65-metre big sister to Arianna, pictured above. Dovi Frances, President of SG Private Wealth Advisors comments, 'With Arianna we broke quite a few records. We financed and oversaw the build of the world’s highest-volume fifty-metre superyacht, we marketed her in a creative fashion which resulted in unsurpassed worldwide media attention. Arianna was awarded as a finalist in every award show possible.' Frances also cites Arianna's successful charter record. 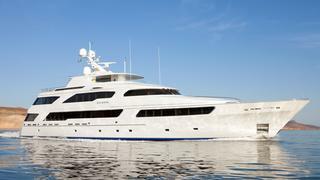 After launching in 2012 and debuting to the charter market in December at the Antigua Charter Yacht Show, she has gone on to book nine charters so far in 2013. SG Private Wealth plans on interviewing and selecting a shipyard and commencing Arianna II’s construction by January 2014. 'The process of choosing a shipyard is also going to be different this time. The opportunity to win this contract is open to every shipyard,' says Frances. 'Delta was an obvious choice for Arianna three years ago and is a great candidate this time around.' SG Private Wealth Advisors will begin meeting with possible shipyards in August and plan to announce the chosen shipyard to build Arianna II in late September.